Român Holidays kohteessa Rooma, Italia: Varaa nyt! The perfect place to spend your Roman Holidays is our small hostel near Termini station. Just a few steps (500 m) from the main hub of public transportation, it`s easy for you to go out visiting all the amazing places Rome displays around every corner and not only. Our hostel is the perfect place if you like discovering step by step the city. So put on the comfy shoes and in just 15 minutes you will be reaching the startling Colosseum or the stunning Trevi Fountain. Ciprian and Andreea, part of our staff, will do their best so that you will have the place that you can call “home” after wondering in the Eternal City. Planning your trip will be easier with us helping you with directions and tips that you might need to get around. And we also offer you some free maps and you will be able to use a computer and the high-speed Wi-Fi. 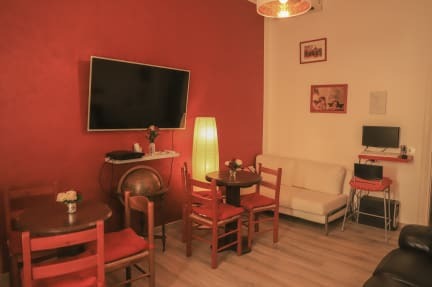 In our living room you can relax while watching a movie or playing Wi, Play-Station, cards, or just share experiences with some of our other guests. If not in mood to go out, you can always cook a light meal in our fully stocked kitchen (we can share some recipes as well). In the morning we offer a tasty Italian croissant, coffee, tea and milk, just so that you have a good start of the day. The payment is in cash or card please! The reception stays open from 8.00 until 0.00 but there's no curfew. The check in time starts at 14:00, if you arrive before you can leave the luggage in our storage. In the morning we offer a light breakfast with croissant, coffee, milk and tea. Lock-out for cleaning is between 10:00 and 14:00. We don't accept online bookings for groups over 8 people. Cancellations or alterations are also accepted via email, 48 hours prior to our check in time at 14:00. Late cancellation or no-show – one night charge. Taxes not included - city tax 3.50 euro per person per night.